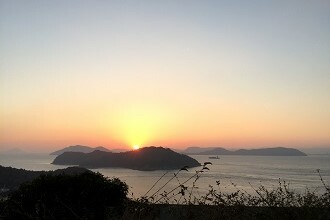 Ube City, in Yamaguchi prefecture, has fantastic views of the Seto Inland sea. The weather in Ube is usually warm, with nice ocean breezes in the summer month. Its location also protects it from many earthquakes and typhoons. Ube City is also quite hilly, so if you plan to bicycle around the city, get ready to use some power from your legs! Since Ube is a smaller city, it’s a great place to really immerse yourself in Japanese culture and enjoy a slower pace of life. In the city, you can check out Sorinji Temple or the local art museum. Tokiwa Park also boasts a lot of interesting sculptures and a zoo. In the winter, be sure to check out the city’s outdoor sculptures! They are often decorated to fit a Christmas theme. From Ube, you can also visit nearby Shimonoseki city or Yamaguchi city by train. My apartment is at a very convenient location, a 5 minute walk from my school and a 15 minute walk to the nearest train station. Although it’s small it has everything I need to live comfortably including a kitchenette, a desk, a washing machine, etc. Because my bed lofted, I also have shocking amount of storage! Additionally my school stocked my cabinets with cleaning supplies and toilet paper. This was not only unbelievably convenient but it was also a great money saver; it really made my start up costs much less than I expected. On top of my usual errands I try do something different at least a few times a month. I’ve gone bowling, fishing, camping, hiking or to nearby sightseeing spots in my prefecture such as Kintaikyo in Iwakuni and Akiyoshidai. My friends and I often play ping pong or billiards which is always fun and inexpensive. Training was very busy but very well organized. I always thought the time was being utilized wisely and I learned everything I would need to know to start teaching. My trainers were ready to answer all my questions. They really helped me feel prepared and confident to start teaching by the end of training. On the weekends during training we were free to do as we pleased. I had time to travel to Naoshima Island from Okayama which was really amazing and a great break during the training.